Hello my lovelies! It seems that I've made it a habit out of posting late on Mondays. I just didn't have the time to prepare the post yesterday because I was out all day. It was a fun weekend, which made it even harder to go to work today. To cheer us all up I have a gorgeous blue to show you. It's the last one of the Kiko shades that I added to my collection last month but believe me that it's just as good as the other ones. 518 or Light Navy Blue is one of those colors that are very hard to describe. I have a weakness for unusual cremes so this is right up my alley. First off, the name doesn't describe the color very well in my opinion. It's more of a steel blue or one of those blues that has a bit of purple and a bit of grey in it. It also has some dustiness to it, which I love, and dries darker than it looks in the bottle. I did my best to capture the color accurately and even did some altering to the photos to make them resemble the real color. That being said, this shade looks quite different depending on the light and the angle it is being viewed from, so I hope you at least got an idea about how it should look like. The polish applied like butter and was opaque in 2 easy coats. I decided to add some stamping nail art over it but after seeing how gorgeous it is I just couldn't cover it entirely. So I used tape to mask some triangles at the tips and stamped just those, leaving the rest of the nail free of nail art. I think it looked pretty cool, especially because I used this image from plate CH33 that has what seem to be tiny gears. I used Orly Rage and was surprised to see how well it works for stamping. I'm impressed! I really enjoyed wearing this look during the weekend. This shade of blue is just delicious! Don't forget that there are more blue manicures in the links below. Check them out! Lovely! 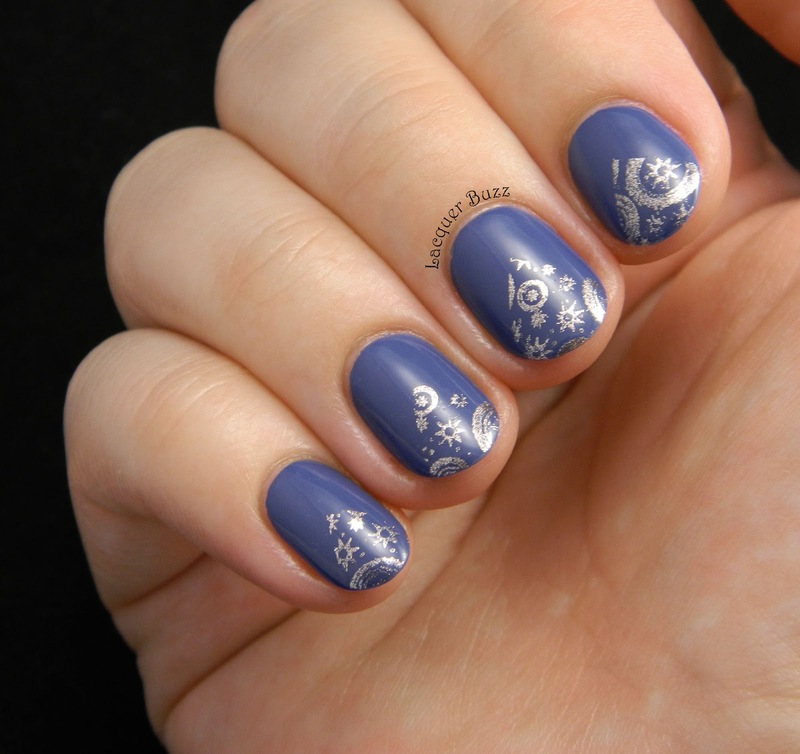 I love partial stamping designs. That blue is so nice and wearable. I love the stamping on the tips too. OPI Solitaire and Designer...De Better!